It's day 3 of this month's release week over at Neat and Tangled. 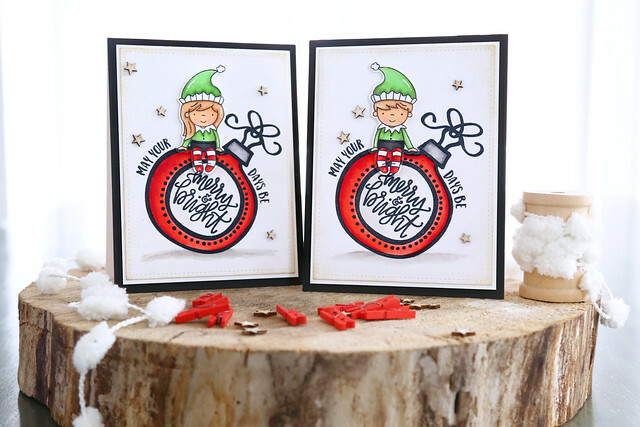 We're showing off the 3x4 Merry and Bright Ornament that Danielle illustrated. It's a great size for a simple and stunning focal point. I cut the Merry and Bright ornament stamp a bit, to remove the words MAY YOUR, so that I could have room to place my elves. I stamped the words a little to the left, and I could always fit the pieces together and stamp them as originally intended if I wanted to in the future. I wanted the elves to look seamless on top of the ornament, so after they were die-cut, I masked them and, using the MISTI tool, stamped the ornament on top. I just love Danielle's whimsical ornament! There is more to see on the NT blog this morning - click! What a genius idea to sit the elves on the ornament. Very cute! These elves a just too cute - great cards. So cute. Love those little elves. Very cute cards--love the little wooden stars for an embellishment & I have some! Awesome design! Such an adorable card! Your cards are so cute ! I love your idea to sit the elves on the ornament ! Really gorgeous ! Thanks for sharing. So cute with the elves on the ornaments. Adorable cards! Love the elves on the ornaments! Delightful cards! Fabulous coloring too! Oh my....you combined those two sets so perfectly! Adorable ! Hahaha - I just realized the wrecking ball comment! Too clever! I had to go back and look at your card again after leaving a comment. It's just wonderful! Love how you've invoked 'wrecking balls' - cute way to use the ornaments! the clittle elves are sooo cute!!! eek just realized this is the ornament post! 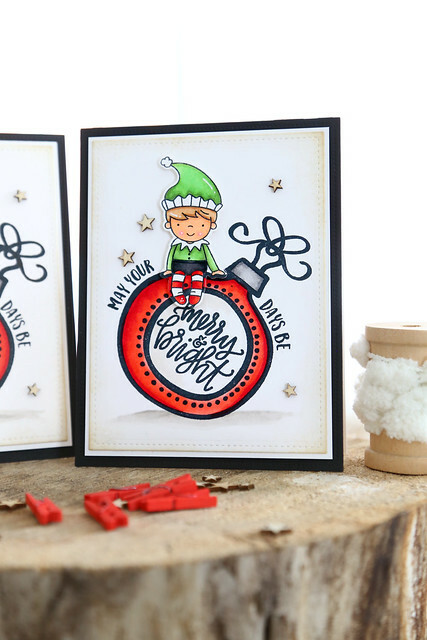 so now you know my favorite sentiment... your ornament cards are adorable, I love those little elves! You color so cute! I just want to grab those pink cheeks and squeeze 'em! Such a CUTE idea for the elf to perch on the ornament!